The Atlantic Asks: Can Marine Le Pen Have It All? Marine Le Pen, the leader of France’s National Front, is the face of European xenophobia. Her policies are typical of the nationalist fervor currently in vogue in both Europe and America, variously described as “anti-immigration,” “anti-Muslim,” “anti-European,” “toxic,” and “nativist.” She has proposed expelling French citizens who are Muslims, sold herself as a populist who can protect native French workers from “wild and anarchic globalization,” and enjoys the thoughts of white supremacists on social media. But despite Le Pen’s corrosive, racist politics, The Atlantic has noticed something that maybe you haven’t considered: Marine Le Pen is a woman. Le Pen has done this by attempting to soften the FN’s extremist edges and embrace her role as a woman, while keeping the party focused squarely on immigration and security. Her illiberal rhetoric about Islam and the Holocaust are still likely to curb the support of some voters who aren’t entirely convinced the FN has shed the racist and xenophobic image that has defined it for years. Here, “embracing her role as a woman,” means softening the party by throwing out Holocaust deniers like her father, National Front founder Jean-Marie Le Pen. The bar, apparently, is very low. The piece also notes that Le Pen has also spoken about motherhood as part of her identity and, in fundamentally American terms, played empowerment off as a brand of feminism. That Le Pen suggests that she can have it all—be a single mom and the leader of a xenophobic party—is far from the feminist/empowerment conundrum that The Atlantic presents. In truth, there’s nothing particularly new here; motherhood has traditionally been used by European nationalists as a powerful iteration of female identity and authority. 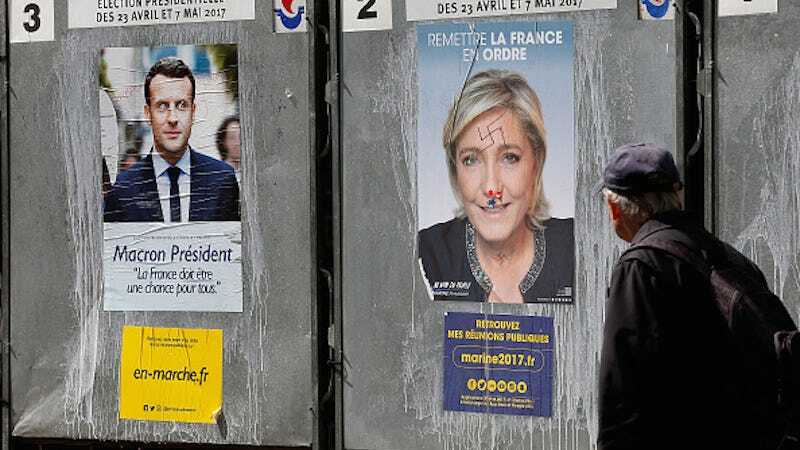 That Le Pen is revisiting an old concept should be treated with a healthy dose of skepticism and within the framework of that history. It isn’t so much a “softening” as it is a modern update of an old rhetorical gesture that reaffirms outdated values. If there is an interesting thread of thought in this piece it’s that a woman’s very presence can make the ideology of the National Front more appealing; that xenophobia can be dressed up as something else when it’s championed by a white woman. That Le Pen’s very presence can lure the so-called media narrative away from racism and xenophobia to focus, instead, on gender, representation, and historic moments for women is perhaps a more interesting story. Ironically though, The Atlantic, just unwittingly wrote that story.